Bergenia crassifolia has big cabbage-like leaves. The leaves will get a hint of red if they are drought stressed or cold. Then for a bonus Winter Blooming Bergenia blooms when most everything else is still languishing under the effects of winter. 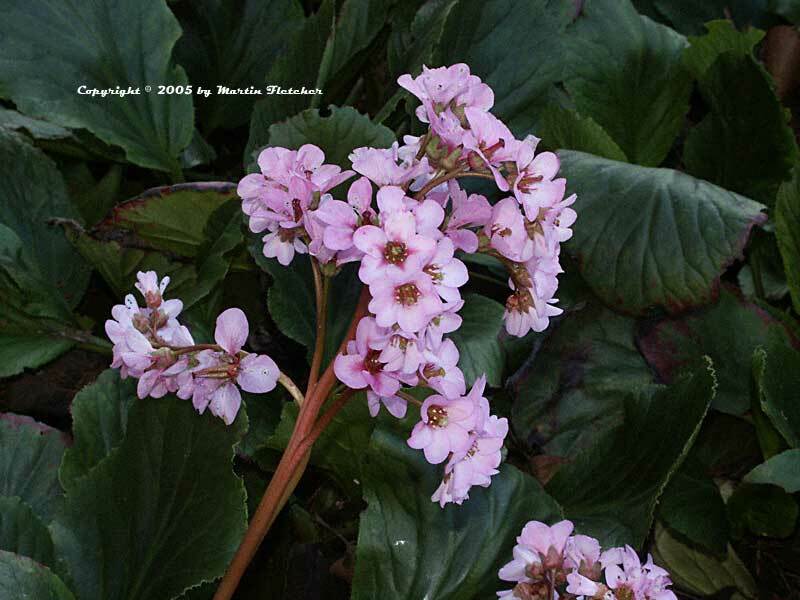 Bergenia crassifolia grows best in light shade and can get along with very little supplimental water. I have seen Winter Blooming Bergenia perform admirably with no additional water in the shade of oak trees near the coast. The leaves grow to 6" and the flowers to 8-10". Bergenia crassifolia slowly spreads by surface runners. Flowers and foliage of Bergenia crassifolia the Winter Blooming Bergenia. High resolution photos are part of our garden image collection.